The Nile and Ancient Egypt: It has been said of Egypt by Heredotus, an ancient Greek traveller, who wrote a history of Egypt, that 'Egypt is the gift of the Nile'. It has been said of Egypt by Heredotus, an ancient Greek traveller, who wrote a history of Egypt, that 'Egypt is the gift of the Nile'. It is true that without the Nile and its annual flood that the civilisation that emerged from the Nile valley could never have happened without the Nile itself. The Nile has two major tributaries, the White Nile and Blue Nile, the White Nile has its source in Rwanda and the Blue Nile in Uganda, the two rivers meet at Khartoum and flows through Sudan and Egypt, ending in a delta on the Mediterranean Sea. It is generally regarded as the longest river in the world and flows from south to north. In the ancient Egyptian language, the Nile is called iteru, meaning "great river", represented by the hieroglyphs shown below (literally itrw). (Nile comes from the Greek corruption - Neilos - of the Egyptian 'nwy' which means water.) The God most closely associated with the Nile, was the fertility god Hapi. Ancient Egypt stretches from the Mediterranean in the North to the First Cataracts at Aswan, though in different periods it also controlled all the territories from the First to the Sixth Cataract (North of Khartoum). Lower Egypt covers the Delta area, which comes from the Greek, faces the Mediterranean, and is fed by two main branches of the Nile. Because of the difference in climate and geographical locations, sites in the Delta area are not as well preserved as those in the South such as Thebes and Luxor. Prior to the Unification of the Two Lands, there also existed Two Kingdoms, the Northern Kingdom (The Delta) was known as the Red Land. The capital of the Red Land was at Buto and consisted of two separate ares Pe and Dep. The Goddess associated with this area is a cobra Goddess called Edjo or Wadjet. Lower Egypt had the low red crown known as the "deshret" and its symbol was the papyrus plant. 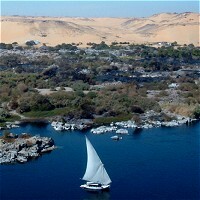 Upper Egypt stretched down to the area of Elephantine, including modern Aswan and the first cataract. The Southern Kingdom of Ancient Egypt was known as the White Land, with its captial at Nekhen, or more commonly known by its Greek name Hieraconpolis. Nekheb was the cult centre of a vulture Goddess Nekhbet. The Crown of Upper Egypt was the tall white crown known as the "hedjet" and its symbol was the lotus flower. Ma'at is the Egyptian goddess of justice. She is a lunar goddess. She ruled over laws, order, and justice, as well as the motion of the cosmos. Her emblem is the feather, used to judge the souls of the deceased. Ma'at is the principal of universal justice and divine order believed to be set forth by her at the time of the world's creation.